Shane Byrne left it to the final minute of the second practice session for the 2007 British Superbike championship finale at Brands Hatch to go top of the timesheets at his local track, with a time of 45.691 seconds on the tight Brands Hatch Indy circuit. The Stobart Vent Axia Honda rider stole the top spot from possible title contender and HM Plant Honda rider Jonathan Rea, who had been fastest for the final quarter of an hour. Gregorio Lavilla was third quickest for Airwaves Ducati, from title favourite Ryuichi Kiyonari. Kiyonari has a strong 37 point lead heading into Sunday's championship decider. The third of the title chasing trio, Leon Haslam, was sxith quickest, just behind Rizla Suzuki's Cal Crutchlow. All of the top six were posting 45 second lap times, with seventh quickest Karl Harris the first of the 46 second lappers on the Hydrex Honda. 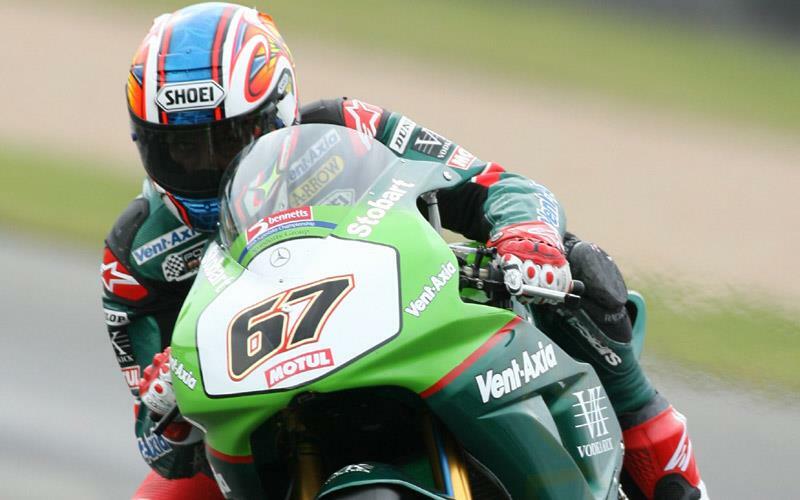 Tom Sykes was eighth fastest, from Chris Walker and Michael Rutter. Tommy Hill was 12th quickest as he readjusts to the British Superbike championship following his outing in World Supersport at Magny Cours last weekend. It isn't even over yet, but you can pre-oder the 2007 British Superbike season review in book or DVD form from Grand Prix Legends. Click here for details. Airwaves Ducati's Shane Byrne completed the double in his final British Superbike weekend today.